For ages I've wanted a big f**k off tattoo. A single huge bold design a la George Clooney in From Dusk Till Dawn (1996). 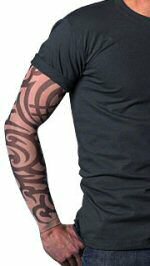 SleevesClothing.Com sells clothes that give you the look of tattoos on your arms and, for women, on your whole upper body. I like this tribal design. Shame they don't appear to ship to the UK.